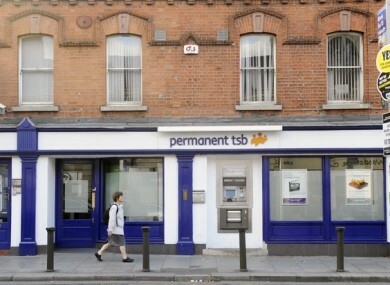 Permanent TSB admitted last year that it wrongly moved customers on tracker loans to more expensive mortgages. THE HIGH COURT has approved an arrangement about the payment of compensation to several bankrupt people in respect of tracker mortgages they had held with Permanent TSB. The arrangement, which was approved by Justice Caroline Costello today, will see various amounts of up to €25,000 paid by the lender to some six individuals previously adjudicated as bankrupts by the court. The amounts to be paid out are to be split with 70% going to the bankrupts and the remaining 30% going to the official administering their estates, Chris Lehane. The official assignee’s office will distribute the 30% share to the bankrupt’s creditors. The arrangement was brought about following negotiations involving parties including PTSB, Lehane, solicitors, the Irish Mortgage Holders Association, and New Beginning groups on behalf of the bankrupts. The application comes in the wake of Permanent TSB’s admission last year that it wrongly moved customers on tracker loans to more expensive mortgages. The admission followed an investigation conducted by the Central Bank which ordered the bank to put in place a redress scheme. The bank said it would compensate clients, return them to trackers and refund them under a scheme called PTSB’s Mortgage Redress Programme. About 1,400 property owners were affected. Seeking court approval of the arrangement, Edward Farrelly BL for the official assignee said the awards were for how its failure contributed to the financial difficulties endured by its customers. Counsel said the largest amount is to be paid to a couple, who are to receive €25,000 each, who had lost their home. Some €12,500 is to be paid to another person in respect of a buy-to-let property he owned that was lost and repossessed, counsel said. Smaller amounts, of between €3,400 and €6,500, are to be paid to three other people who did not lose their properties, counsel said. PTSB consented to the arrangement. Counsel said that Lehane believed this arrangement, when factors including the amounts involved and the costs of any potential litigation were taken into account, was the best for all concerned. Lehane said in a sworn statement he accepted the 30% on grounds including it was arguable in law that the amounts paid to the bankrupts by PTSB could fall outside the bankruptcy estate. In each of the cases PTSB was the primary creditor, he also noted. Lehane said while he had regard for other creditors it would also seem fundamentally unfair and harsh that the full amount paid out should be withheld from the bankrupts. Justice Costello said she was “happy to approve” the arrangement. The judge added the court could see the benefit of the arrangement to all parties. Email “Six mortgage holders win compensation of up to €25k from PTSB”. Feedback on “Six mortgage holders win compensation of up to €25k from PTSB”.